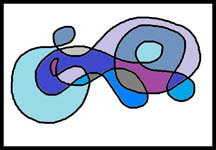 Take a look at some of the Doodle Art Activities I have listed below. They work great in the classroom setting as well as with families. They are all relatively simple to do, but is fun for all ages. They can also be modified for different grades and purposes. Take a look! Write some old fashioned letters to some grandparents other family members then take some time to decorate the envelopes using bright colors and bold designs. They will absolutely love it and not to mention bring a smile to the mailman's face! Choose a shape (rectangle, triangle, circle, etc.) and use ONLY that shape (and various versions of it) to draw a picture. It's amazing what can be created with such simple instructions. This example was done using only triangle inspired shapes. It might be a little more challenging than you think. Have fun! Try doodling on something that's not paper. My doodling surface of choice? The Beach. Nothing is more therapeutic than a day at the beach, and when you add doodling to that, it really doesn't get any better. This was done on the southern Oregon coast, in my opinion - the prettiest place on earth. Come together as a family and come up with a family logo or brand. Just a little doodle art that represents who you are. This can also work in the classroom. Make your own class logo! Write the family members name on a sheet of paper and put them in a hat. Each family member draws a name and then begins to draw pictures that represent the person you picked. They can include sports, food they like, favorite activity; anything that says something special about that person. Just do the best you can. Then take turns showing off your picture to your family. It is such a great family activity that can bring everyone together in a fun and positive way. 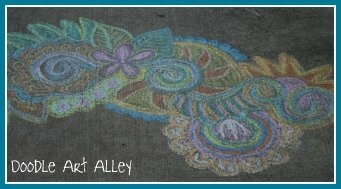 I love drawing with sidewalk chalk. This is one of my favorite doodle art activities. Working together as a family, see how big you can get your artwork. Try to color in the entire driveway! This is a fun activity for schools. Get your class or whole student body involved and create a huge mural. Take some plain clay pots and give them an artistic facelift! Each family member can decorate a pot and pick a flower seed to plant and help grow! ​1. Using straight lines, separate a blank sheet of paper into 4 sections. 2. In one section, draw 3 shapes. 3. Create a border decoration for one of the sections. 4. Draw a circle in an empty section. 5. Choose a different section and draw another circle. 6. Connect these 2 circles by a set of parallel lines. 7. Make 6 dots anywhere on the paper and connect them with wavy lines. 8. Draw one shape, 3 different times, in 3 different sizes. 9. Draw triangles in 2 corners of your paper. 10. Initial in one of the triangles. 11. Color in as you wish. For those classrooms that have really big windows, this project works really well. Take some tracing paper and draw a doodle art design using some bright markers. Tape them up on the window where the sun shines through and what you get is a great stained art effect. It looks wonderful! Have each of your students draw their own coloring page and put them all together to make a class coloring book. It is such a great class project and really means a lot to the students to have their own artwork included. 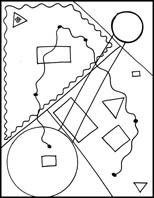 ​I learned this doodle art activity back when I was in elementary school and just loved it. Began with a blank sheet of paper and color 3-5 (or more) tiny circles with one color. Switch colors and color around all the tiny circles making another circle. Make sure you take your time! Continue until the entire paper is filled up. The end result looks great!